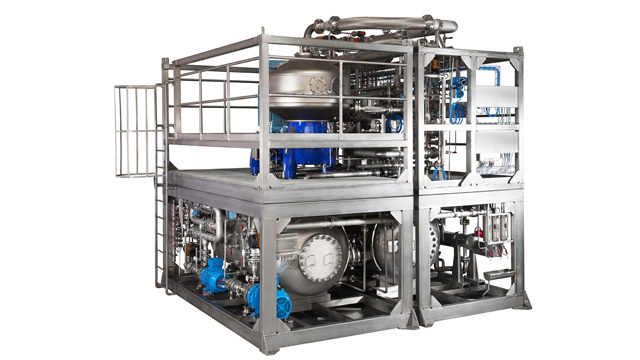 The Alfa Laval OFX 20 disc stack centrifuge system is specially designed to provide the oil industry with a highly efficient way to remove water and solids from heavy crude oil. Interest in exploiting reserves of heavy crude oil is accelerating worldwide. However, processing such crude so it meets with pipeline specifications has traditionally been a costly, time-consuming process featuring extremely large, static vessels and the use of lots of heat and chemical demulsifiers. The Alfa Laval OFX 20 disc stack centrifuge system is designed to provide a rapid, highly efficient way to remove water and solids from heavy crude oil in order to deliver consistent, refinery-spec oil downstream. Achieving such separation using centrifugal force rather than heat energy provides key benefits in terms of environmental profile and CO2 emissions. Removing as much water as possible before the oil is transported also paves the way to substantial logistics savings. This fully functional modular installation is delivered on an offshore skid complete with all the necessary equipment, piping, instruments, valves and controls. This innovative solution is equally effective for both onshore and offshore installations, including drilling platforms and FPSOs. However, the high throughput and space-saving design of the Alfa Laval OFX 20 system provide particular benefits for offshore facilities, where space and weight are at a premium. The design configuration features only a minimum of components as well as extensive use of abrasion-resistant materials. This helps minimize downtime, as well as greatly reducing inventory requirements and maintenance costs. The OX20 centrifuge system can process a wide spectrum of crude oil types (with specifications down to 11.5 API) as well as considerable variations in composition. OX20 systems can be configured to comply with Zone 1/Class 1 Div 1 specifications and also with ATEX Zone 1 and 2 regulations. A conversion kit is also available so the same equipment can also be used for removing oil and solids from contaminated water, ensuring that it can be discharged responsibly. The Alfa Laval OFX 20 is a three-phase high-speed centrifugal separator system purpose-built for removing water and solids from heavy crude oil at the same time, and without the use of costly heat inputs. The type of centrifuge at the heart of this system is a development of the well-known Alfa Laval nozzle bowl disc stack centrifuge, and is also widely known as a purifier. The OFX20 installation is built around a disc stack centrifuge, consisting of a bowl that rotates on a vertical axis, with a stack of conical discs in the centre. Rotating this bowl at high speed creates a controllable centrifugal force that presses the solid particles and water – which are denser – outwards towards the bowl wall, where they accumulate and can be discharged separately. Crude oil is fed into the rotating bowl via a patented OPTIFLOW disc inlet, which gently accelerates the liquid while preventing shearing, droplet splitting, foaming and the formation of additional emulsions. It also helps make sure less gas gets trapped in the flow. Any solid particles and water present in the oil separate outwards along the discs, moving towards the periphery of the bowl as a result of the centrifugal force. The design of the disc stack causes the water and solids phases to separate from the oil phase in a counter-current flow, making it possible to remove even the smallest particles and water droplets. The purified oil moves towards the centre of the bowl and exits through a paring disc into the oil outlet pipe. Specially designed nozzles allow continuous discharge of the solids extracted from the crude. Some energy is also recovered, due to the tangential direction of the nozzle spray – thus reducing power consumption. Discharge is then flushed through the nozzle water outlet in the bowl casing. A patented OPTIPHASER system controls the oil-water interface during processing by automatically compensating for changes in the flow rate and feed composition. This is done by balancing the feed with sufficient buffer water to ensure the most efficient separation, and makes it possible to accept anything from 0–100% oil content in the feed, right from zero to full feed rate (25,000 bpd/170 m3/h).